Affectionately (or not) known as 'the Book of Lies', John Moynier's Backcountry Skiing in the High Sierra was groundbreaking in the sense that it was the first ski guidebook to reveal (mostly) the secrets of the Sierra. Perhaps it's inevitable, in a state with so many people, that California mountaineers would tend to hoard their backcountry secrets. 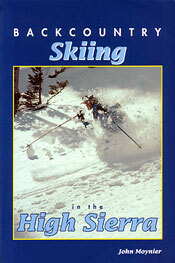 Unlike Colorado, where public access and information about the mountains exists in abundance, there was little information to be had about backcountry skiing in the Sierra until California mountain guide and photographer John Moynier published his guidebook. Moynier may have ruffled some feathers back in 1992 when he released this book. While it wasn't the very first guidebook to California backcountry ski routes, it did open up vast swaths of previously-secret stashes to public viewing. In any case, the secret is out: California contains some of the world's best backcountry skiing. While Backcountry Skiing was groundbreaking in its time, the book is rather brief in its route descriptions—some might say vague, even. Compromises, after all, must be made. And one suspects Moynier withheld at least a few the Sierra's gems. I can't say whether the author did this to preserve the pleasure of discovering them on your own, or to prevent you from ever finding them. That said, the book offers several spectacular ski routes across both the length and breadth of the California Sierra Nevada, any of which would be the backcountry tour of a lifetime. note: John Moynier has released a revised edition of Backcountry Skiing in the High Sierra, now titled 'Backcountry Skiing California's High Sierra,' and featuring and expanded, more detailed route information.